What ended up happening was that the GSV130 served as a base point on which I gauged my future experiences with immersion circulators. 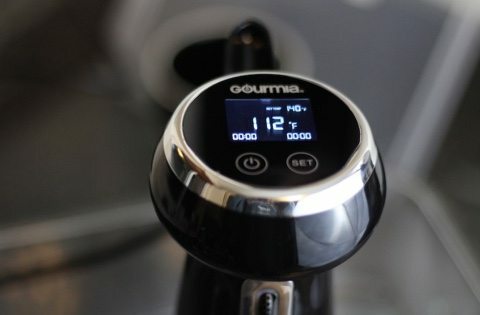 The Gourmia GSV130 was such a solid immersion circulator at such an inexpensive price, that I really had to look for reasons why someone would spend more than two times more on an appliance that basically did the same thing. 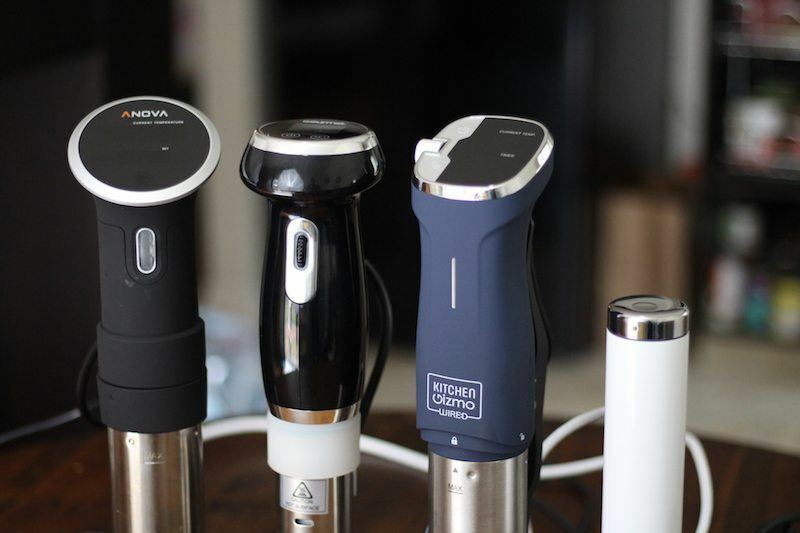 Of course, some of the newer sous vide devices out there are worth the money. I'll mention some in this review. But for someone brand new to sous vide who doesn't want to spend a lot of money getting their first device, the GSV130 is a solid choice. I've even picked it as my #2 selection for inexpensive immersion circulators. Keep reading this detailed review about my experiences and recommendations to see if this is the best immersion circulator for you, or if you can get something better to suit your needs. 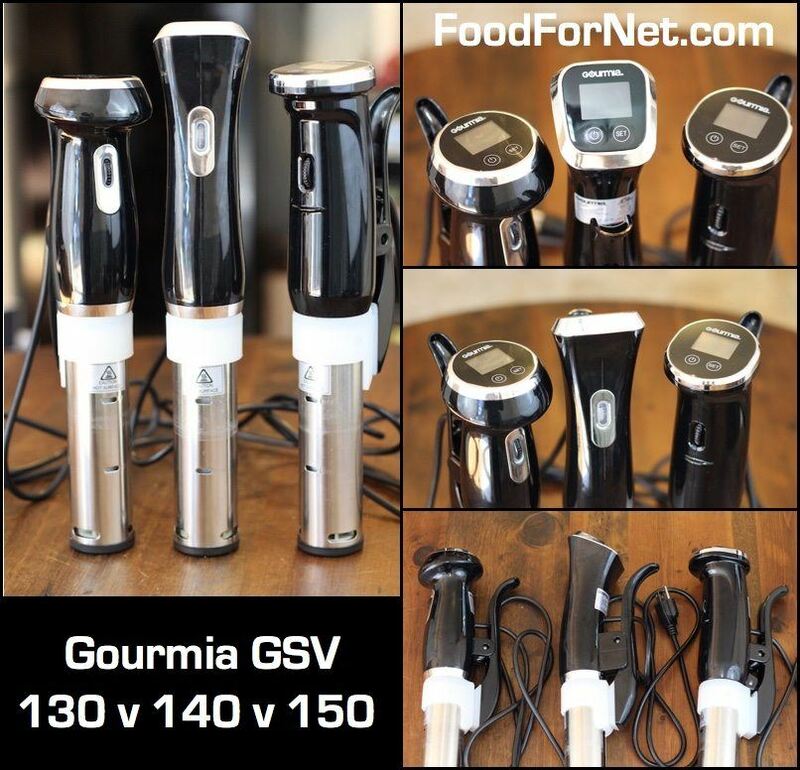 The Gourmia GSV130 is a pretty basic device, so you won't get that many “extra features”. But the basic-ness is what makes the GSV130 easy to use and understand. There are two buttons to use, and programming you device is pretty simple. To change from C to F, just hold the power and SET button for a few seconds. Then tap the SET button to set hours, minutes, and desired temperature. You can use the black dial on the front of the device to add or subtract time/temp. Then, tap the power button to begin. These are not tactile button – they are flat, like on your phone. I prefer the clamp style featured here, the “lever” style system, as opposed to the “screw down” system that other devices use. You can see the two types compared in this image below. I find the clamp style faster and more convenient! The other style is not terrible though, and does work better if you are dealing with thick-walled containers like an ice chest. One cool feature of all Gourmia immersion circulators is that you get a reminder to start and stop cooking your food. Sure, most (not all) devices give a warning beep when the water is ready to start cooking, and once again when the cooking is done. However Gourmia wants some interaction to ensure you start your food on time! Once the target temperature is reached, it will continue to beep every 3 seconds until you press and hold the SET button. Some chefs may find this annoying, but I think it's convenient. That way I can finish what I'm doing, but not forget to put the food in. Also, it doesn't start the countdown timer until you press the set button. Then the beeping will stop, and you can cook in silence! Another thing I like about the Gourmia immersion circulators is that they continue to cook after they reach their target time. If I'm an hour late getting home, I'd rather have a properly heated steak that's a bit more done than I like, than a cold bloody one because the circulator automatically shut off. Some devices just shut down when they're done, but I prefer Gourmia's setup. Don't forget, you can buy this device in 3 different colors: Black, White, or Bronze! As mentioned in the introduction, of all the immersion circulators I tested, I probably practiced with the GSV130 more than others. 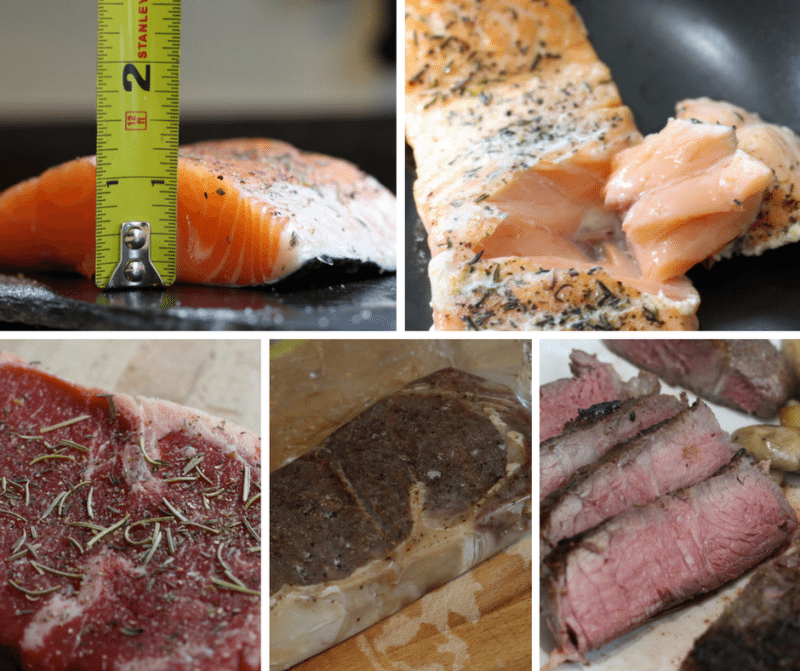 I was a little obsessed with cooking accuracy, so would measure all my cuts of meat with a tape measure so make sure I set the temperature and time correctly. But as you can see from the steak below, I was also a little nervous about undercooking the meat, so got a little crazy with the pan searing. I didn't produce perfect steaks in the beginning, but they have improved since then! The salmon I made using the sous vide technique was just amazing. Since then, I've cooked a few pan-fried versions and it's just not the same. You just can't get the buttery-soft, melt-in-your-mouth texture like you can get using sous vide. I hate reading instructions, so it took a few trial and errors to get things right, but eventually I figured out how to use this immersion circulator. Since then, I've done more research on it and read more about the GSV130 so I could give you an accurate review LOL. Alright, so details written out in a list are boring, but they are a little important because it can tell you whether this device is what you need. The 2.3-pound weight of the device is pretty standard, but on the lighter side if you look at all immersion circulators. They range from 1.3 up to six pounds. This won't really play into your buying decision. A more important detail is that fact that it has 1200 watts of heating power, which is very strong. 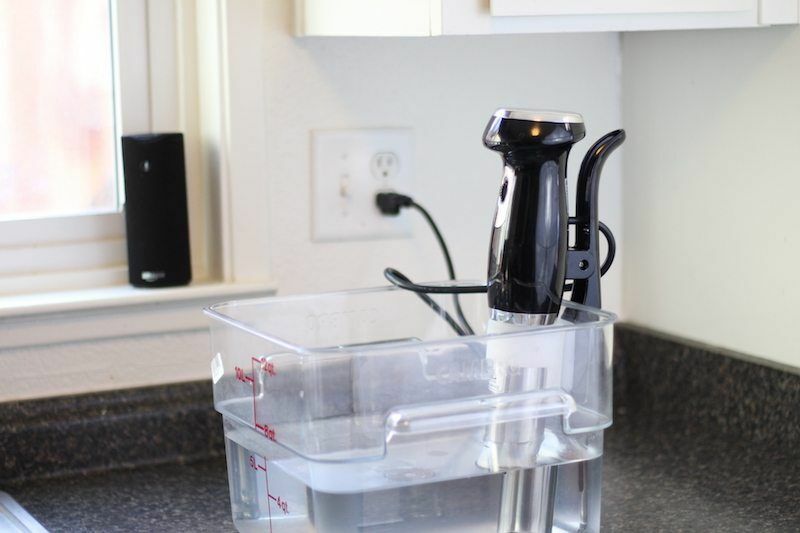 This means you'll heat your water quicker, and start cooking faster. If you're waiting for water to heat while you cook some poached eggs for breakfast, that can really be useful! If you're cooking a steak while away from the house, then it's not as big of a deal, but I do prefer to have more power. Especially since this is a 1st generation device selling at a discount that makes it 3x cheaper than other devices makes it even more attractive. Plus, some of those more expensive devices only give you 800 watts of heating power. WHAT?! Yeah, it's true. 1.5 GPM for water circulation is not very much though, so you should only use this device with 5 gallons of water maximum. You could possibly go up to 10 gallons if it's a sealed and insulated container. The GSV140 is slightly stronger with a 2.1 GPM and they actually say on the box that you can do up to 10 gallons. However, they stepped it down again for the GSV150, reverting bcack to the 1.5 GPM pump speed. I think the GSV140 is slightly noisier because of it, but that's just based on my impression, and I haven't actually measured the decibels! This is the fun part! Let's start with the GSV130 versus newer generations of Gourmia brand immersion circulators. Yes, I've bought and reviewed all of them. Yes, some will be future Christmas presents for family members LOL. I've bought 13 devices in total. I don't need all of them, and it's not fair to test then return them to the seller. 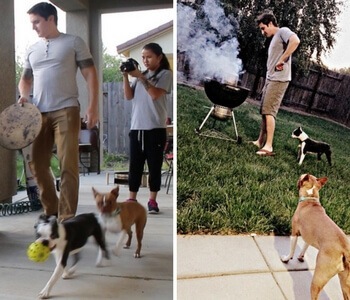 There are quite a few similarities between the three. The clamp style is the same, and they are all a similar shape and size, and they all use the same interface to operate. The only major design difference is that the GSV140 has a reversed display and a light-up dial. 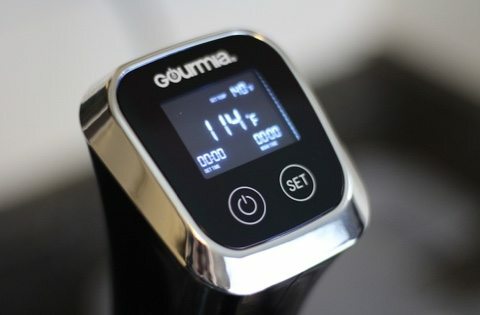 They all have 1200 watts of power, which makes Gourmia the fastest-heating immersion circulator of the 13 devices I tested, but a few do come close. I'll just spoil it and let you know that the GSV140 is my currently my favorite of the bunch. Why? It's got a stronger pump (2.1 GPM) which means I can use larger water baths and cook larger amounts of food. Both the 130 and 150 are designed for smaller containers, but will do great cooking for a small family regardless. The GSV150 does have a major upgrade though, in that it is wifi-enabled. That means you can operate the device remotely. This could be useful to monitor your cooking while away from home. You can start your device, then leave it cooking for a few hours while you go shopping or pick up the kids or pump iron at the gym (with a delicious steak waiting for you at home). Another cool trick I learned is that you can put ice in the container to keep meat cool from morning to afternoon, then start your device remotely while at work and have a a perfectly cooked meal when you get home. However, the Gourmia app still needs some work. 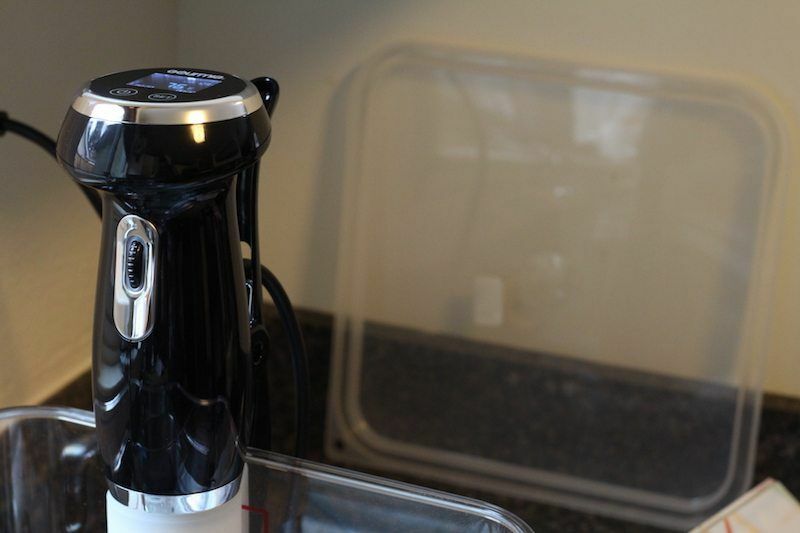 I'll be writing a post comparing all the wifi-enabled sous vide devices [LINK] soon, but for now, you can read my review of Joule, the #1 choice of the bunch. The 150 is still a good choice, but it's about 50% more expensive than the 130 with the exact same stats, but the addition of remote access. Here's where your choices get interesting! In terms of price, the GSV130 is currently comparable to the AdirChef and Sous Smart SSV2700. 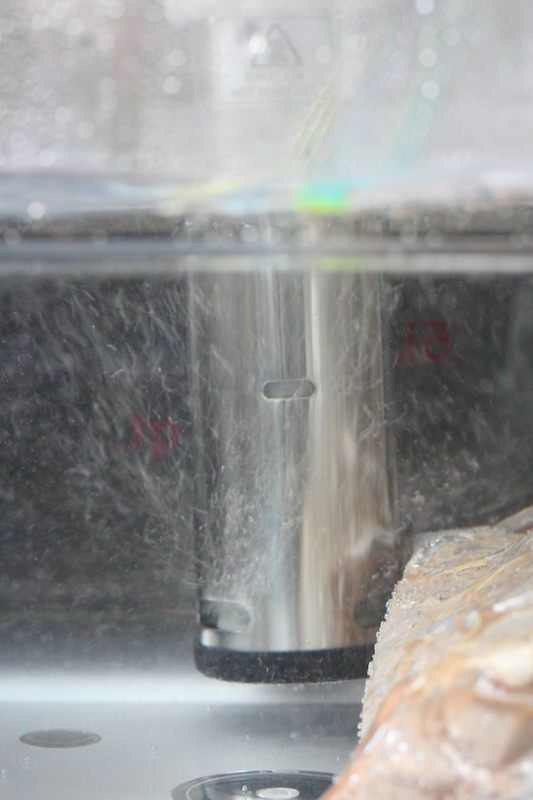 Keep in mind, both of those devices have a similar tank capacity, but a smaller heating element. 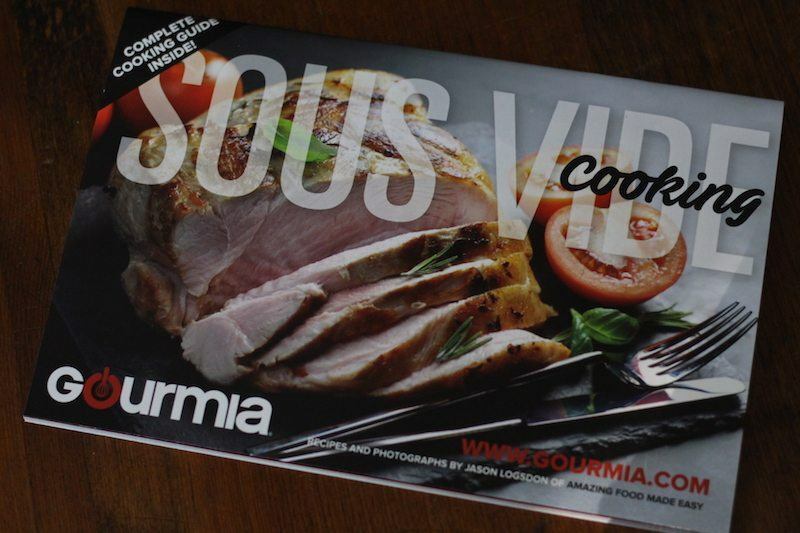 Sous Smart support is handled by Gourmia, so it may actually be a Gourmia product. I suspect the same of NutriChef immersion circulator which has a strikingly similar design. 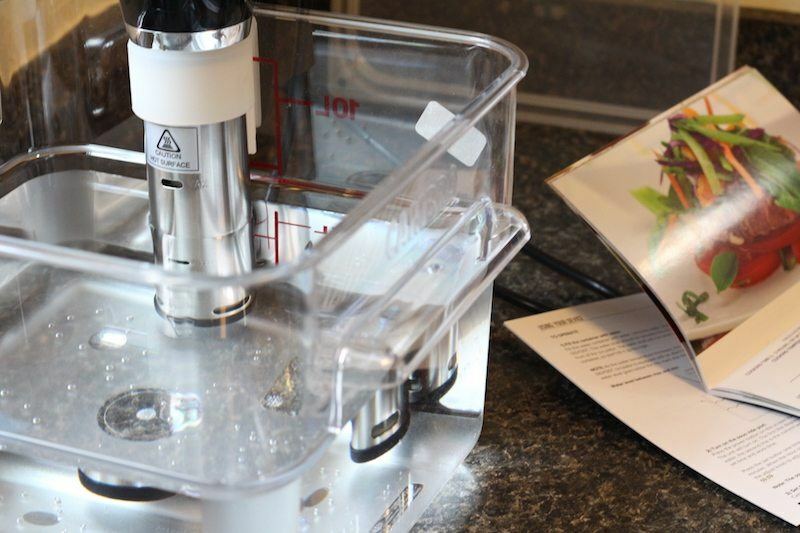 The Kitchen Gizmo Simplified Sous Vide was just a few dollars more, and has a number of very interesting advantages. For one, it's quieter, although the noise the pump makes is a little annoying so I would still prefer the GSV130 over the Kitchen Gizmo. The design is stellar though, and it makes for a very cool-looking kitchen appliance. Not only does it have an impressive set of colors to choose from, but it also has fancy lights and a nice metal spin-dial to accent your device. Design wise, Kitchen Gizmo takes the cake versus any Gourmia device, but it only has 800 watts of power, so will take longer to heat water, but it has 2.1 GPM so you will heat a larger water bath than the 130. The last device you really need to consider in comparison the Gourmia GSV130 is the Joule. 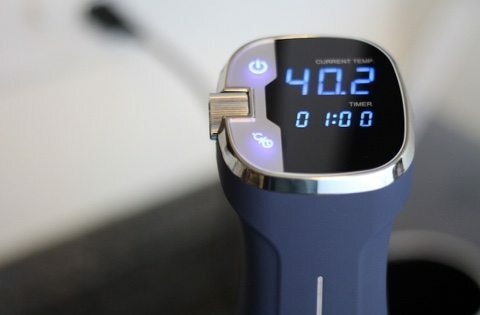 If you are looking for the “best” sous vide immersion circulator, then Joule from ChefSteps is simply the best out there in my opinion. It's more expensive, but it's got so many advantages above any other cooker out there that I can't list them all of them here. Go check out the review if you are looking to spend a bit more money and buy a device you won't feel the need to “upgrade” later. Who Is The Gourmia GSV130 Best For? This is a really easy device to recommend because it's such a solid product at a cheap price. 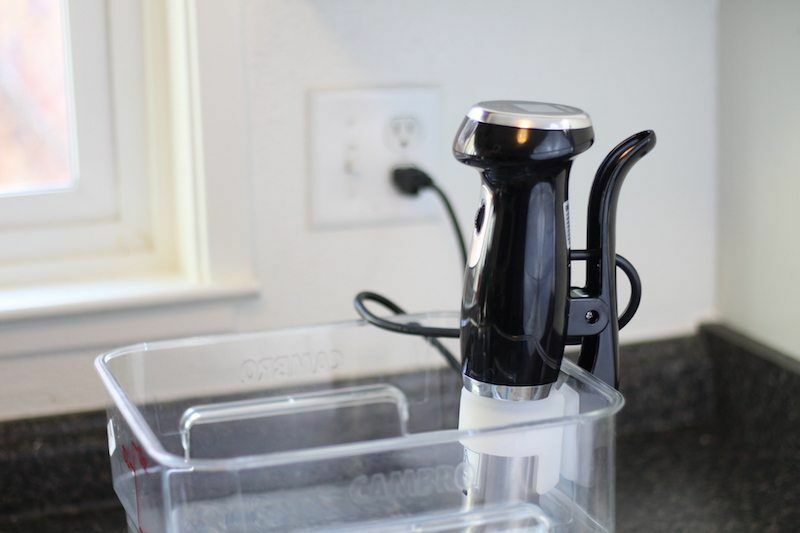 If this is your first venturing into sous vide cooking and you want to buy the most inexpensive product out there (while avoiding the trash products), then the Gourmia GSV130 is for you. Honestly, as a seasoned sous vide chef, I still like using it. For me, personally, it also makes a good travel immersion circulators since I'm not worried about bumping it around. I'll keep my nice appliances (i.e. the Joule) at home, thank you! ==> Get The Gourmia GSV130! I'm glad I started off with the Gourmia GSV130 and that my sous vide cooking lessons went smoothly thanks to a quality device. If this was my only immersion circulator, I would be totally satisfied and not need to venture off into fancier products. However, now that I now how cool it can be to access your device remotely, and I have a choice of designs, plus a business budget to buy and test these things, I do prefer other models to the GSV130. 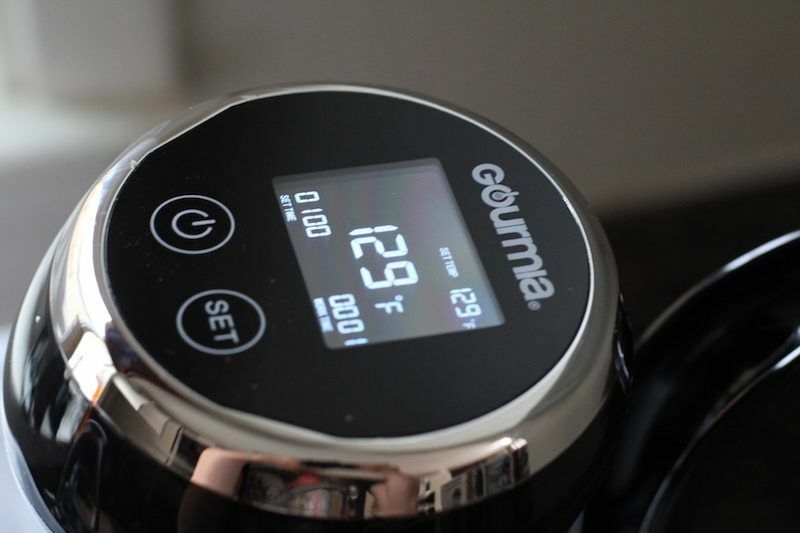 Check out my review of the GSV140 to see my favorite Gourmia immersion circulator. 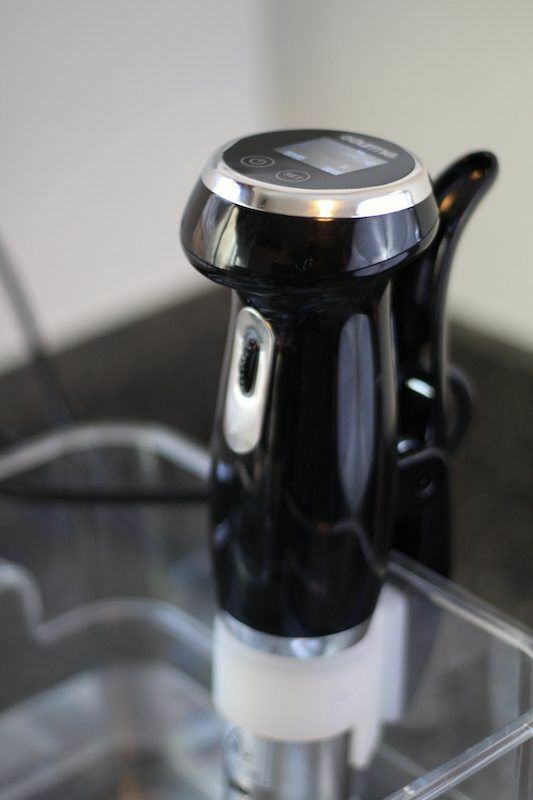 I've already linked to the Joule above, but you are interested in that product, you should also ready my review of the Anova Precision immersion circulator since it also connects to wifi and has racked up over 1200 positive reviews on Amazon! ==> Get The Gourmia GSV130 Here!